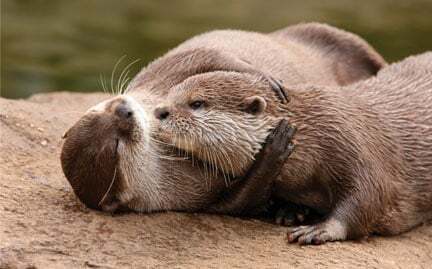 Members of the weasel family, river otters are very playful, wrestling with one another, bouncing objects on their paws and sliding down muddy embankments. River otters are built for swimming with a streamlined body and tapered tail, short legs with webbed feet, dense fur, small ears, and nostrils that can close underwater. Other than when females are caring for their young, otters are usually solitary creatures. Mothers and offspring generally stay together until females give birth again.